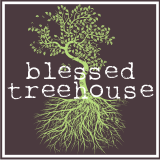 Blessed Treehouse: What I learned from the toy box. What I learned from the toy box. Can I start by saying that toy box was the best $80 we ever spent? For those of you who have been to our house, you know we don't have a lot of toys "sitting out." The bulk of our loose toys fit in that box. And back in the day when it was just me and my man, we used the "toy box" as an ottoman and blanket storage. But now that our lives have been taken over by our minis and all their crap, it is used as a bench seat and toy storage (Target still carries them.) And don't worry, I'm not a big enough blogger to be bragging on Target for free product. So that plug was all out of the goodness of my heart. Enough about that, do any of you remember this? Sadly, I can hardly remember it. Thank heavens for digital photography. Henry was diving in and out of the toy box before he could even walk. And I mean literally diving (here's video proof). Harper, on the other hand, didn't even try to get into the thing until she could reach her leg over the edge. She's very proper like that, thankyouverymuch. Once in the toy box, Henry spent f-o-r-e-v-e-r trying to climb out. Harper would NEVER. When she is finished being in the toy box, she declares her unrest and demands immediate removal. She doesn't even try to get out. It's "get me out of here or your eardrums will be very, very sorry." And if for some crazy reason she did try to remove herself, and she dove out of the box like Henry did (remember the video), Harper would freak out. FREAK OUT. Henry dove out and turned right around and dove back in. Harper cries when the dog runs by her too quickly. I can't even imagine what she would do if she fell 4 inches out of the toy box. But the funny thing is, I adore their differences. Adore them. Henry's my shake-it-off-and-jump-back-in-the-game tough guy. Harper's my how-dare-you-allow-me-to-lose-my-balance-and-fall-on-my-padded-diaper diva. And though there are moments when I secretly wish Henry would cry and insist I console him or Harper would pop back up without having me rush to her rescue, I am so thankful that they each need me differently. Because it's one less area of my life that's stagnant and comfortable and perfected. Instead I spend my days challenged and humbled and imperfect. Meaning I have to call on God a heck of a lot. Which is exactly where He wants me to be. I can hardly wait to see what challenges H&H bring me as they grow into little people and then awkward adolescents and then rebellious teenagers. Actually, I don't mean that at all. Growing up is for the birds. I'll stick with the toy box and all it's shenanigans as long as time allows. i think we have this same toy box/ottoman! we (meaning Josh) just brought it up from the basement and put it in the baby's room for toy storage. i'm glad it's held up well for your family. I think you should take a picture of them in the toy box together every year until they get married. They would LOVE that. this. was. wonderful. and, i agree with Marla. I could look at her all day.